When something is rebuked you are saying certain behavior or action being done is not acceptable to the Lord. As Christians we are making something known in darkness and bringing it into the light and knowledge of the truth of Christ. (Ephesians 5:8-17). For ye were sometimes darkness, but now are ye light in the Lord: walk as children of light: (For the fruit of the Spirit is in all goodness and righteousness and truth;) Proving what is acceptable unto the Lord. 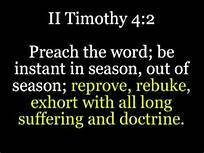 And have no fellowship with the unfruitful works of darkness, but rather reprove them. For it is a shame even to speak of those things which are done of them in secret. But all things that are reproved are made manifest by the light: for whatsoever doth make manifest is light. Wherefore he saith, Awake thou that sleepest, and arise from the dead, and Christ shall give thee light. See then that ye walk circumspectly, not as fools, but as wise, Redeeming the time, because the days are evil. Wherefore be ye not unwise, but understanding what the will of the Lord is. Without rebuking or reproving we are living without making a difference for the Lord who by His grace has saved us. Just as God chastens those He loves, it is also out of love when we reprove one who has forsaken the way to eternal life for without this action they will die. (Proverbs 15:9-12). The way of the wicked is an abomination unto the Lord: but he loveth him that followeth after righteousness. Correction is grievous unto him that forsaketh the way: and he that hateth reproof shall die. Hell and destruction are before the Lord: how much more then the hearts of the children of men? A scorner loveth not one that reproveth him: neither will he go unto the wise.